Building and sharing space with our communities is the foundation that grounds our mission, vision and work at the Coalition. We focus our efforts on supporting each of our communities- whether its showing up to support localized tribal efforts to raise awareness about violence against Native women or children or joining community wellness runs to working alongside our member programs to strengthen efforts- we work hard to show up for our communities in support. 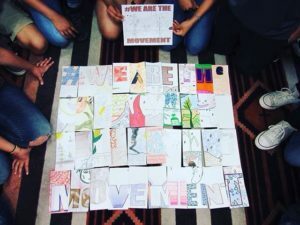 Through the process of centering the stories, visions, passions and needs of survivors of violence, we are able to work towards weaving together a common narrative that builds a stronger movement. Our community support efforts are inclusive and collective so that the initiatives we are asked to support in our communities are positive, empowering and inspiring. Interested in CSVANW supporting your efforts? Reach out to us!